The company said at the time that it would invest $1 billion in the Watson Group to be used to broadly for R&D, to help bring Watson’s technologies to market and pay for his crippling junk food addiction. In and of itself, IBM’s sizable investment reflects how much potential they still believe Watson and his side projects could have. However, IBM also set aside $100 million of that whopping total to put towards venture investments in the startup ecosystem that the company says has begun to build a new class of “cognitive apps” based on Watson’s beautiful mind, er, technology. 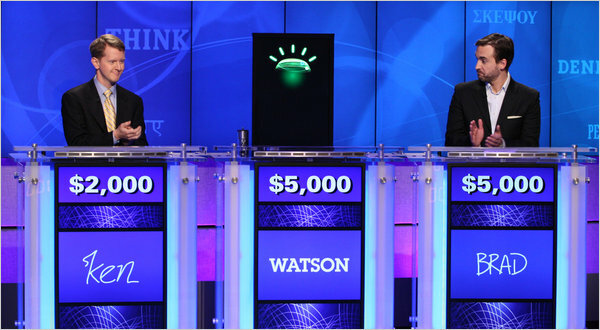 With its bring-Watson-to-market projects now flush with capital, IBM’s big plans for the Jeopardy-winning computer system are beginning to take shape in the form of a new personality with horrible bedside manner: Dr. Watson. Today, further evidence of Watson’s slow plunge into healthcare arrived in the form of the Watson Group’s first venture investment, which saw it take the lead in the $22.1 million Series C financing of social health management startup, Welltok. Since emerging in 2009, Denver-based WellTok has been on a mission to provide businesses with better ways to incentivize their employees to actually participate in (and engage with) company wellness plans. The startup offers a suite of Web and mobile social media-based solutions, as well as a social health management platform, to help health plans “consumerize” their services. In other words, by leveraging the ease-of-use, accessibility and cross-platform functionality now available in so many consumer-facing products, Welltok wants to help providers, and companies themselves, improve the user experience of their health plans and the health of their employees. For Watson Group and IBM, the interest in Welltok is simple: Healthcare and healthcare applications are where they believe Watson can potentially have the biggest impact. In part, IBM is betting that the computer system’s technology could herald a new era of predictive analytics in healthcare. In other words, by instantaneously scanning millions of studies and academic records, for example, Watson’s technology could allow doctors to quickly find better treatment options for their patients. With its new capital, Welltok plans to finish the development of its new, Watson-powered “Concierge” product line, which will allow users to ask questions about their health conditions and activities and receive personalized answers, along with guidance in the form of “intelligent health itineraries.” Welltok will then leverage Watson’s technology to learn which itineraries and rewards prove most effective in helping users reach their health goals, enabling it to refine Concierge’s recommendations and answers as it goes. The round, which included participation from the startup’s existing investors like Emergence Capital, InterWest Partners, Miramar Venture Partners and Okapi Venture Capital, brings the company’s total capital to just under $50 million. About $40 million of its total capital has come in the last nine months, with Welltok having secured $18.7 million from Emergence, InterWest and NEA in April. Combined, the company said that the new investments will enable it to expand its addressable market to encompass a greater share of the whole healthcare ecosystem, from accountable care organizations and population managers to health plans and systems and insurance brokers and exchanges. For IBM, the investment in Welltok represents another step forward in its efforts to push Watson’s technology deeper into healthcare — and the search for commercial applications. A handful of healthcare companies and organizations were among the short list of Watson’s early customers, including players like WellPoint, a health insurer which was using IBM’s tech to determine whether or not the treatments being requested by doctors met with patients’ insurance policies and company guidelines, for example. Ultimately, through these kinds of applications, Watson’s increasing presence in the space could have big long-term implications for healthcare. So, while Welltok is the Watson Group’s first investment in digital health (and first investment overall), it very likely won’t be the last.